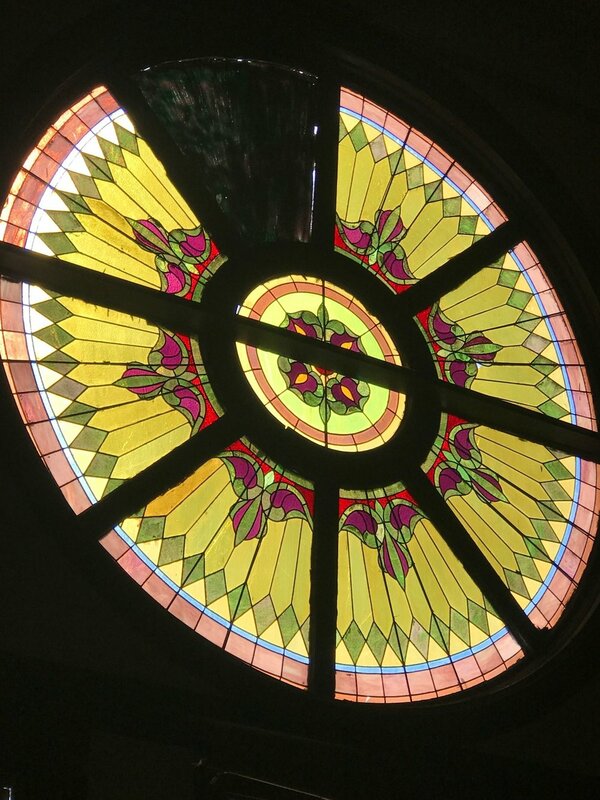 March 2019, the new painted siding is installed on the exterior..
One of the beautiful stained glass windows shown from the inside of the church, May 2018. The old church at 1009 Hermitage and Diamond in Grand Rapids began as the Third Reformed Church in 1875. A little more than 100 years later the church was added to the National Register. Today the old church is on its way to becoming a community center and is getting a beautiful new facade of white siding. Only two years ago, I was at the meeting of the Grand Rapids City Historic Preservation Commission when they discussed giving the building a status of “demolition by neglect” so they could set deadlines for repair and dedicate public funds to save the building, working with the tiny congregation that owns but no longer worships at the church. Residents who attended that meeting spoke to the importance of this structure to the East Hills and surrounding Midtown neighborhood. As reported by Jim Harger, in the July 21, 2017 issue of the Grand Rapids Press on MLive, Rhonda Baker the city’s historic preservation specialist had described the building as “an excellent example of a very early framed church structure.” She said,"We don't have many of those in the state, much less the city." It served Dutch immigrants who lived in what was referred to as the "Brikyaat," or brickyard neighborhood. The photos shown below with the exception of the photo on the left were taken spring 2018 on our tour of the building with owner Carol Moore. 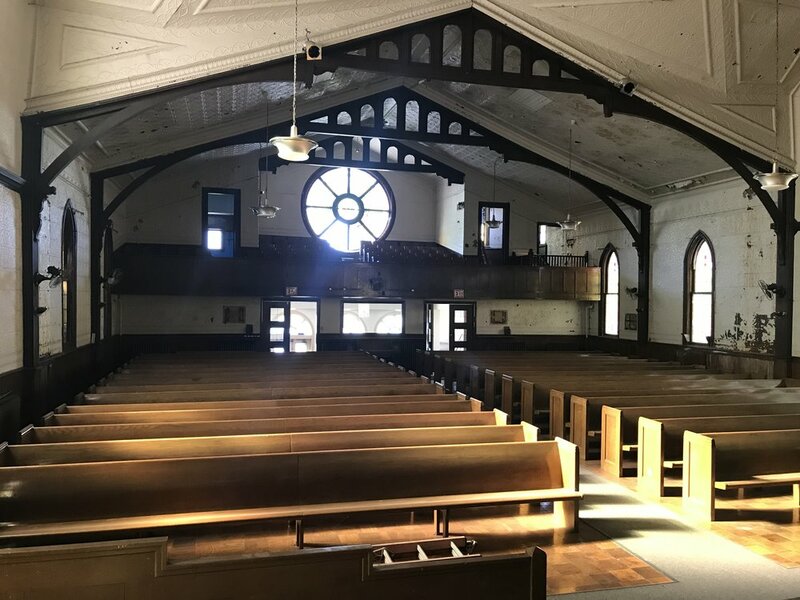 In October 2017, Carol, an experienced preservationist, had purchased the building for $100,000 and set about saving it with a new vision for a Community Center. Her extensive history with preservation in the city has included the restoration of the beloved Wealthy Street Theatre. In April 2018 Carol gave a tour of the buildings to my friend Marilyn and me, pointing out the beautiful windows, the lovely woodwork and trim and talked about her hopes for it as a performance space and arts center for the community. It looked like an overwhelming project, but Carol knew how to approach it and we have observed the continued activity of bringing this important building back to its original beauty. One day driving by the building, I saw the workers on scaffolding installing the pre-prepared white siding. It is truly an amazing transformation and we look forward to watching as one more of our gorgeous old historic buildings is reborn as a place where people can come together to enjoy both the space and the art that is so abundant in our community. History: According to History of Grand Rapids and Its Industries, Volume 2 by Dwight Goss found on Google, Third Reformed Church was established in 1875 because of the “extraordinary growth the Second Reformed Church and the number of its congregants that lived on the east side of the city. It was common for the Dutch community to build wooden frame churches because they could be large and impressive without the high cost of similar masonry structures. The membership began with 62 members but quickly within months expanded to 90 families. The building was at first small and was quickly expanded, and then was expanded again in 1886. The young people of the congregation built a lecture hall in 1880. The first minister was Reverand Kriekard who stayed with the congregation for 27 years. It says that under his enthusiastic leadership, the church grew to 185 families and 261 communicants. In 1900 a new parish house was built next door to replace an earlier building and Kriekard retired due to ailing health in 1902. The church was home to the Third Reformed congregation until they moved to a new location and sold the church in the 1960’s. After that it served first the African American community and then the Hispanic community. For more information link to this story from the East Hills Council of Neighbors Facebook page https://www.facebook.com/EastHillsGR/posts/10161566268365147.